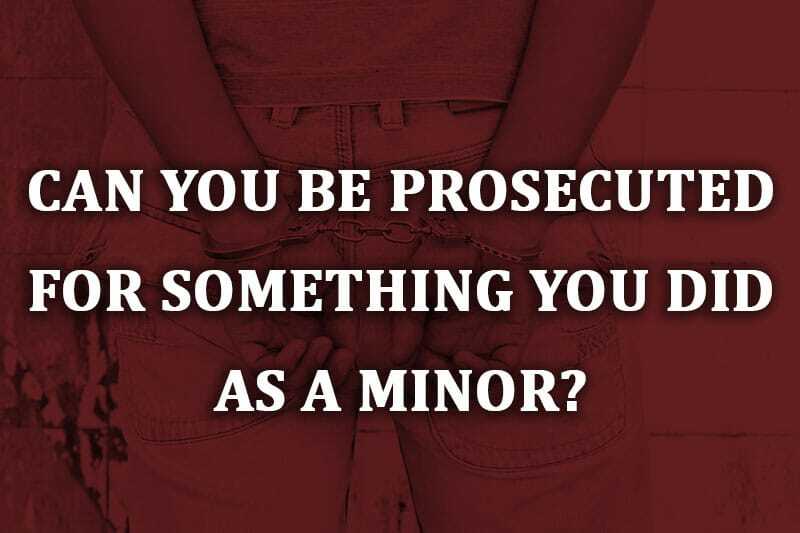 Can You Be Prosecuted for Something You Did as a Minor? Being charged with a crime is intimidating, especially if you have no information about what happens next. If you are now an adult being charged with a crime you committed while under the age of 18, understanding what that means for your case is helpful. When accused of a juvenile crime as an adult, the rules regarding which crimes are considered juvenile, how statute of limitations rules work, whether an adult can go to jail for a crime committed as a minor, and what happens when an adult is tried as a juvenile should all be kept in mind. The age of a child at the time of committing a crime is a huge factor in determining whether or not the crime is prosecutable. Children are often presumed to lack legal culpability for crimes in the United States. If an offense is committed at the age of 9, courts will likely treat that differently than a crime committed at the age of 17. The more serious of an offense committed, the higher the chance a crime is prosecutable. The rules for prosecuting crimes are such that severe crimes like armed robbery or murder are less restrictive on the prosecutors than crimes like vandalism or theft. Different courts have different rules regarding prosecutability of crime. When trying to determine whether or not a crime is eligible for prosecution, it is essential to check which jurisdiction the crime falls under to see what the rules for prosecution are in a particular case. The statute of limitations passing is the clearest and most common way one commits a crime as a minor that they cannot be prosecuted for as adult. Most crimes have a statute of limitations, which is a length of time between the committal of a crime and when one can be prosecuted for committing it. Statute of Limitations for Juvenile Crime: Can You Be Charged for a Crime Years Later? Whether or not the statute of limitations expires for a given crime is entirely independent of the age of the alleged perpetrator of the crime. There is no statute specifically for juvenile crime; crimes themselves have a preset period during which they can be tried. For example, in the state of Nevada, theft, robbery, arson, burglary, forgery, and sexual assault all have a 4-year statute of limitations while gross misdemeanors have a 2-year statute. Can You Go to Jail for Something You Did as a Child? Yes. Whether or not you will go to jail for a crime committed as a minor depends on several factors. Different states have different laws governing how they treat crimes committed by minors. If a severe crime is committed, in most cases, individuals are tried as adults irrespective of their age. For example, if the state accuses a 16-year-old child of murder, they are likely to be tried as an adult, even if they are still legally a child. In most cases, juvenile courts lack jurisdiction over individuals aged 22 and above. However, given that most crimes have a statute of limitations of less than four years, if you committed a crime as a minor and are now 22 or older, you likely cannot be tried for the crime. Most states have legislation in place that details specific age ranges for which adults can be tried as children. For example, a state can dictate that individuals aged 18-21 will be prosecuted as children for crimes committed under the age of 17 if the crime is such that they would have been tried as an adult when the crime was committed. If you are an adult that committed a crime as a minor, reviewing your state’s laws will help you better understand your situation. Several factors affect whether one can be prosecuted for a crime committed as a juvenile and whether or not you will be tried as a minor or an adult. Because the rules vary, the best way to get a handle on your situation is to consult with criminal law attorney.